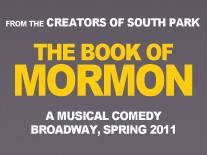 Steve On Broadway (SOB): Confirmed Broadway Booking For "Mormon"
Yesterday, producers confirmed dates for the upcoming Broadway musical The Book Of Mormon. A collaboration among "South Park" creators Trey Parker and Matt Stone and Avenue Q's Robert Lopez, the Casey Nicholaw-helmed tuner will begin previews at the Eugene O'Neill Theatre on February 24, 2011, and open one month later on March 24. The story follows two modern-day Mormons in Africa, with scenes from the life of Joseph Smith, founder of the Latter Day Saints movement, peppered throughout. Hilarious, audacious -- and guaranteed to offend just about everybody ... I know of several insiders who are still sore from laughing so hard. With no sacred cows among this team, you can no doubt expect an idiotically irreverent, completely crude and overtly politically incorrect musical.